I’ve got a good one for ya, I get calls all the time fielding problems with folks on the road having problems. Some of them are issues there would be no way to prepare for, things that no matter how many parts you would replace— stuff still just happens. Other issues may have been picked up with a regular maintenance program while still others could be anticipated and backups or work arounds could have been added to the coach to mitigate the impact of. Some people think “why me” and look around for Murphy hanging out in their coach. This short story is one about something that was set up with a backup system that saved the day. I’m not going to have to use a situation from one of you calling in your troubles, this one happened to me. I drove my Janie and some of her close friends to Jacksonville this weekend (@ 130 miles) for a lock in/birthday party for one of her girlfriends there. I made it an opportunity to stop by & check in on my Mom so it was a win/win for us all. We brought Larry (my coach) to get them a chance to party on the trip and to carry some geer up to my son who also lives in Jax. Maybe you could cal it a win/win/win trip. Anyway, on the ride home on Sunday evening, I noticed the coach surging a bit and loosing power on hills (hills are overpasses in Florida). I was close to home and the coach was still running so I figured I’d try to stab it all the way to the house and almost made it. Less than 2 miles from the house at a light– the motor simply shut off when I touched the gas. Oh great, I drove all this way to have my party walk the last 2 miles home was my first thought. Quickly, I went through different possibilities and tried to think through the problem. I guy pulled up in a pick up with a chain and offered us a pull to at least get the coach off the road. Thanks man, and while I scrambled to connect the chain, I thought through my options. I had Janie get out the AAA card and make sure the cell phone was working, I already had my generator on so I was good to go there so now we were into the “get safe” mode then I could test some of my repair theories. A chain on the bumper shock got us into a parking lot, I thanked the guy and let him know there would be “manna in heaven” for his good deed– tried to pay him but he said I’ve needed it and someone helped me so this was his payback– man it was a good thing Karma kicked in at the right time! Next I told everyone to sit tight and let me try a few things. Hitting the key, the motor barely turned over– kinda like the motor was partially froze, my starter or battery was fried. In that the trouble I was having had nothing to do with the starter, I thought of going toward a bad battery or cables. Cool, all we need to do is hit the boost switch and if the chassis battery or cables were dead, the motor would fire over on the living area battery, afterall, the generator was running throwing 40 amps from the converter and there was a hot battery on that circuit. I flipped the switch, hit the starter —- and nothing happened! Now wait, how can that be? I know I have strong power now– maybe I do have a major problem—- (froze motor or something like that). Still staying with my first blush, I opened the pass. hood for a looksee at my battery. 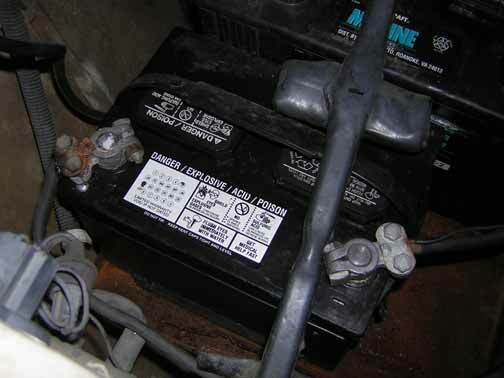 Wow– look at that– the positive terminal on the chassis battery was melted off! May not look like much from a first glance but if you look closer, you will see the trouble . 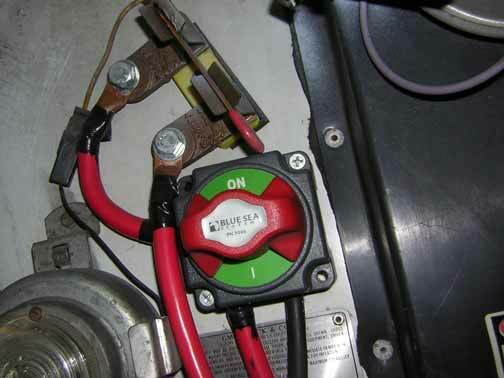 Just goes to show you how darn important it is to keep your battery terminal clean and tight. The terminal had corrosion on it and since the hold down bolts were probably loose cause I had not checked them in a “raccoons age”, the resistance from all of that created enough heat to melt off the connection. OK, that explains where my power went but hey, why didn’t my boost solenoid save my bacon? 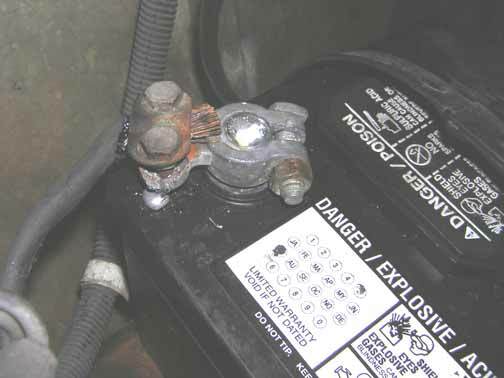 2 weeks ago, I found that Greg D. coach had suffered from a bad boost solenoid– sure it clicked when I hit the button but it did nothing to tie his batteries together— Hmmmm, maybe that my problem? So, to test that theory out I looked over at the “combiner switch” I had installed to mechanically tie the 2 electrical systems together in an emergency. If the boost solenoid was working but fried, this combiner switch would bypass it and make a strong current path around it. I used sealed switches now but a year ago, I was installing “Frankenstein switches” for that duty. It will still work and do the job as the new better switches so I said to myself a few words of prayer, closed the switch and wiggled it in to break come of the surface corrosion on the bare copper, and went to the driver seat for the big test. The starter hit, the fuel injection computer allowed the crank to turn over twice and she fired up. Now thats what I’m talkin bout!!! Preplanning for 12 volt failure issues with the combiner switch gave me a “go to” option that saved the day, the hot living area battery and generator running the 40 amp converter zinged the motor to life and kept her on the stick. We all piled back into the coach and pointed it down the last 2 miles of the trip. Janies friends were a bit freaked out after driving so long, having a breakdown in a 30 year old vehicle they at first had some reservations with but getting over that were shocked when we got so close to home and broke down. Adding to their “shockness” was the fact that from a dead hulk blocking traffic, I was able to diagnose the troubles and actually have a “thingy” that would make it work like there was no problem and finish the trip never having to break a sweat! Their confidence in the coaches ability to party down was saved and I could stand down from my own possible disaster. The moral of this? 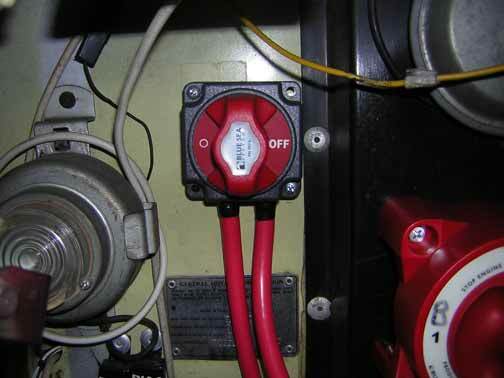 #1– install a mechanical “combiner switch” across your boost solenoid, it will give you many emergency “go to” options #2– just because your boost solenoid clicks when you push the button does not mean it is doing its job– if your boost solenoid is old (maybe origianl), give it a gold watch, retire it before it retires you! Neither of these parts are expensive but if I had not had at least one of them working— well, you get the picture. Hey, and don’t think it all happens to you— I work on these things and it happened to me! See, Murphy has no discrimination, the problem here was from time, corrosion and relying on old parts– you just can’t do that!! 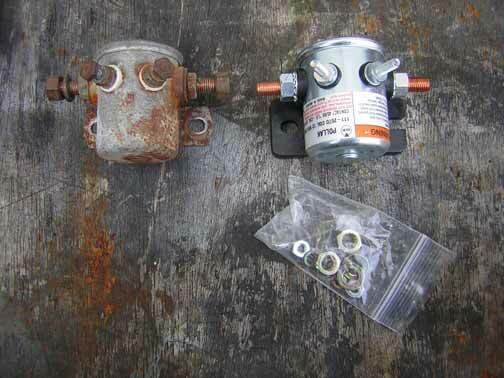 OK, I wanna hear from you, go out and take a look at your boost solenoid, if it looks crusted over just hanging out minding its own business— call me and order a new one right now! It’s only $26 brand new and it fits right back onto the original bolts and also get a combiner switch , they are only $23 but man it could save you big bucks not to mention your honor!